I’ve been busy over the last couple weeks getting myself organized for Christmas. I made a promise with myself that I would not leave everything to the last minute. With a little bit of extra planning, I’m hoping to have everything ready by the first week of December. That includes completing my Christmas shopping, decorating the house AND completing a couple Christmas craft projects. I’m channelling my inner Martha this year! One item I’m crossing off my to-do list is getting my Christmas printables ready to go. Free printables are hot and I have several coming up on the blog over the next few weeks, including this festive one I’m sharing with you today! 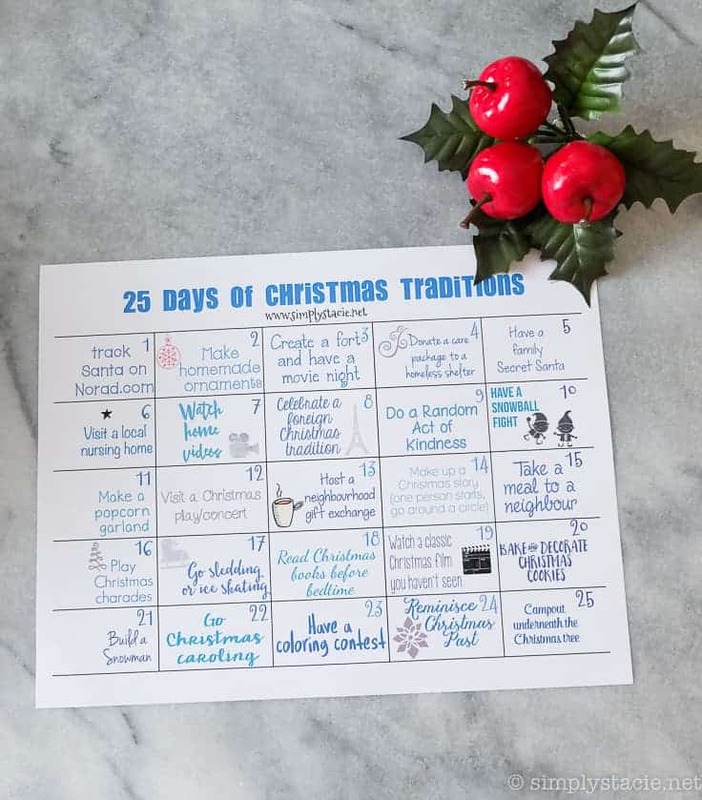 I have a 25 Days of Christmas Traditions printable for you to print out before the end of the month. 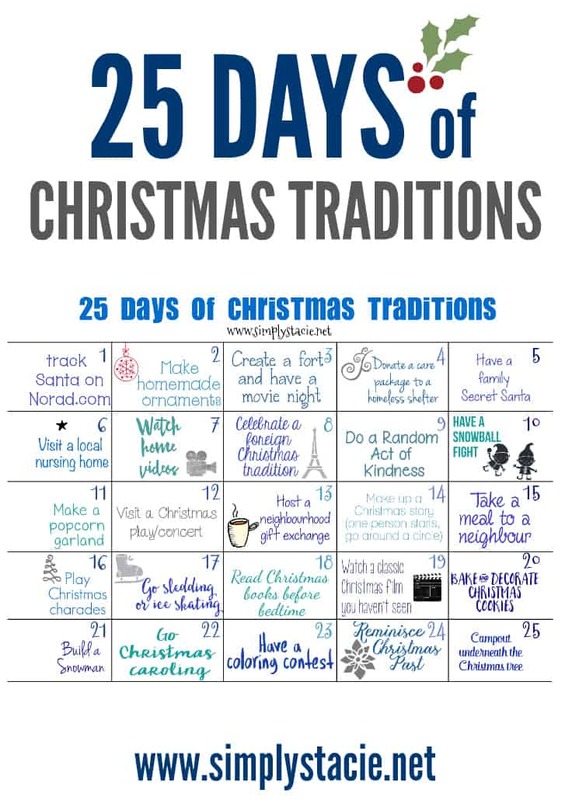 Then on December 1st, check the daily activity to do with your family to get in the Christmas spirit. Start some new traditions and get set to make memories. That’s my plan too! I created this printable for a few reasons. The first one is so we’d have something to do together as a family. My oldest daughter, Olivia, is in her last year of high school so it’s a bittersweet occasion for me. Another reason is to have some fun activities that are beyond the normal things we do together. I want this Christmas to be our best one yet! I printed out our calendar on my HP ENVY 5530 e-All-in-One printer and it’s on the fridge ready to go for December 1st. My youngest daughter, Bridget is super excited about all the interesting things we’ll be doing together. Even Olivia, my teen, seems intrigued, though she hides it well! With all the fun free printables online, you’ll want to make sure you are well-stocked up on ink for your printer. It’s the worst feeling when you find an awesome printable and discover that you are completely out of ink. It’s happened to me in the past and makes me so frustrated! I usually find one late at night when the stores are closed so I have to wait till the morning to run to the store to get ink. I recently learned about a solution to this very problem. What if I told you there was a way that you will never run out of ink again? Yes, it really does exist! With an HP Instant Ink subscription, you’ll never have to deal with the frustration of running out of ink mid-printing or have to drive to the store in search of ink so you can finish your project. An HP Instant Ink subscription is a simple solution to this very issue! Your HP printer will let HP know when it’s low on ink automatically. Then, new ink cartridges will be delivered to your doorstep before you run out. You won’t have to worry about running to the store to buy ink or run out at inconvenient times. Besides the convenience factor, it’s also cost effective. An HP Instant Ink subscription saves you up to 50% off the cost of HP Original Ink. They have a variety of monthly plans that are based on the number of pages you print and not the amount of ink used. The price you pay includes everything: ink, shipping and ink cartridge recycling. HP will send you pre-paid envelopes to return your used ink cartridges and HP Planet Partners will recycle them as part of the package. 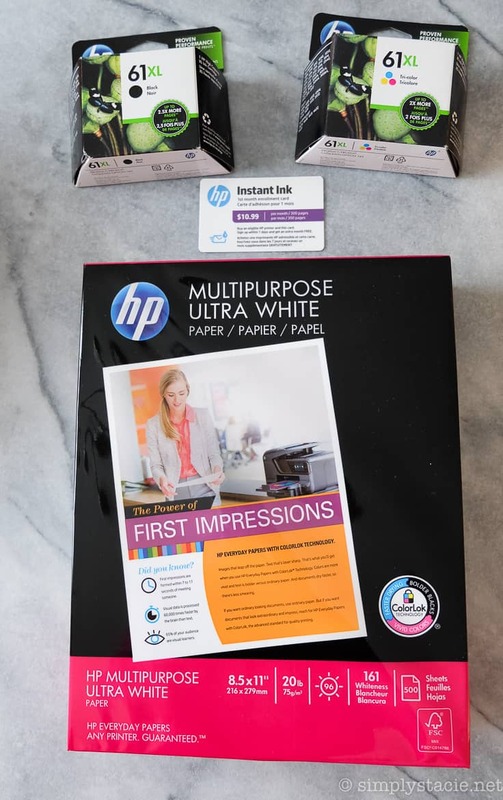 The HP Instant Ink subscription plans start at $3.99/month for occasional printing (50 pages per month) and go up to $10.99/month for frequent printing (300 pages per month). This is great news for us because running out of ink is a pet peeve of mine. I’m glad to not have to deal with it! Besides my printable projects, my oldest daughter uses the printer for her school assignments. Sometimes, she will leave things to the last minute so running out of ink the night before her essay is due is NOT an option! Learn more about the HP Instant Ink subscription and see how it can benefit your family too. For more fun printables, check out MyPrintly. I’m loving all the DIY gift ideas. So fun! 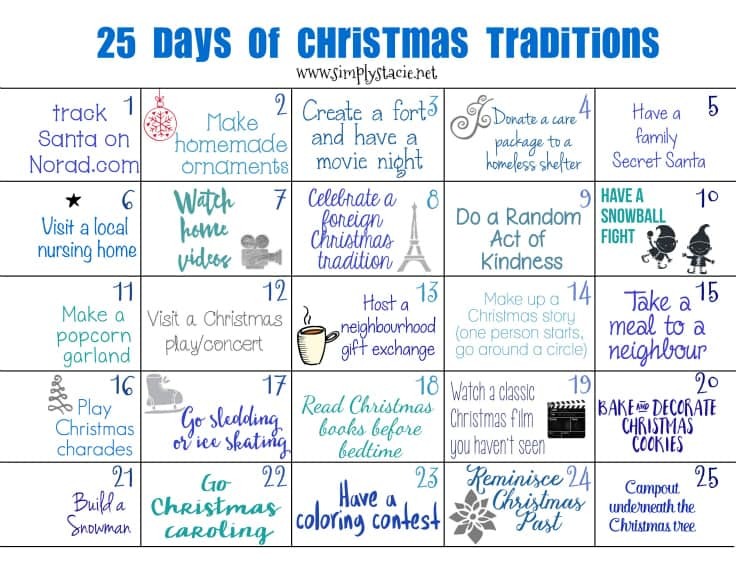 I hope you’ll join us this year in our 25 Days of Christmas Traditions and make lasting memories with your family, too. I love the convenience of it. I always run out of ink and then it’s a pain to remember bringing the cartridge to get refilled at the store. Thanks for sharing your blog printable at the Inspiration Spotlight Party. Shared.